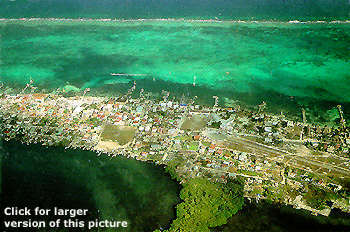 Your first impression of Ambergris Caye is likely to be from the air, because most visitors to the island fly into the Philip Goldson International Airport at Ladyville just north of Belize City and then change to a local commuter (the international airport has a new domestic section) for the 20-minute hop to San Pedro. Flights to San Pedro are day-time only. You board your Maya Island Air or Tropic Air flight. The equipment is likely to be a small Cessna Caravan or Twin Engine Islander. Hey, these are not 727s. It can be a tight squeeze for larger passengers, and if you're small you may be sitting in the back with the luggage. But both Maya Island and Tropic have excellent safety records. They fly hundreds of flights a week with few if any problems. 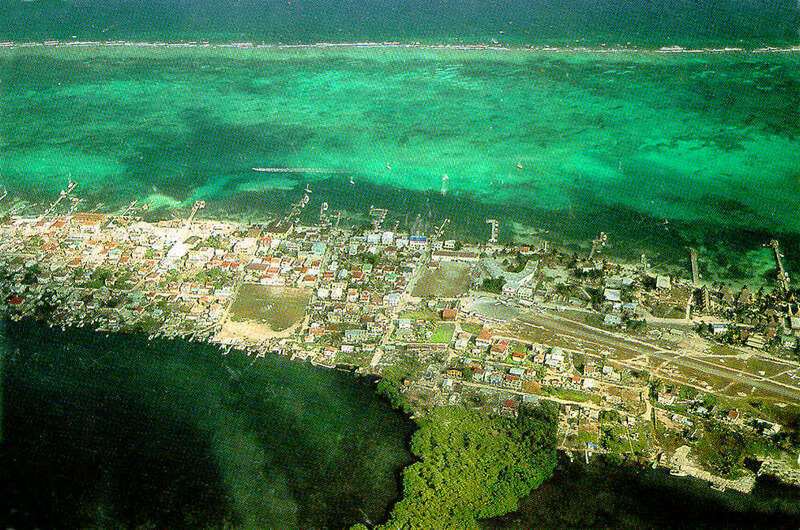 As you fly the 35 miles to San Pedro, your little plane soars over several islands, including Hen and Chicken Cayes, the larger Hick's Cayes, and then Caye Chapel (site of a new small golf course, the only course in Belize). 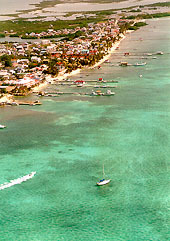 The large caye just north of Chapel is Caye Caulker, the second-most developed and most-populated of Belize's islands after Ambergris. Some flights make a brief stop at Caulker before going on to San Pedro. On a clear day, you get a great introduction to Belize's Caribbean Coast. As your plane goes low over the transparent water, you'll see mangrove- or sand-edged islands, coral heads, the sand and sea grass bottom, fishing boats and sometimes the blur of large fish. You'll come in over the south end of the island. Hol Chan Marine Reserve, a popular snorkeling site, is just off the southeast tip of Ambergris. A few houses dot the southern coast of the island, becoming more densely clustered as you approach the town. Just a few hundred yards off the east side of the island is the barrier reef. Usually the water inside the reef is a turquoise color, while on the ocean side it is a deeper blue. Ambergris Caye isn't a large island. It's 25 miles long and only 4 miles wide at its widest point. Much of the island is low mangrove swamp, and there are a dozen lagoons. The air strip, 3,000 feet long, comes into view and within seconds you're on the ground. As you taxi to the small airline buildings at the north end of the air strip, you'll see, in the bright glare of the sun, the southern end of San Pedro Town. Several popular hotels and condotels are at this end of town. Most resorts meet arriving guests in a car or golf cart, but if yours doesn't you can take a taxi or, if staying nearby, make the short walk. 00:00- Taking off to the East, time starts as wheels leave the ground. You can see Haulover Creek off to the right and the Belize River delta to the right and front. Flying over forested flood plain. 1.15- Flying out to sea over the coast line, over shallow, murky water, dominated by mud and very fine sand brought to the sea from the Belize River. This is an area of silica based sand and mud deposition (called clastics or siliciclastics by geologists) with minor carbonate sediment. There are small islands on either side of the plane, the ones on the right are called Hen and Chicken Cayes. 2.00- The water is clearing, this is still mixed clastic and carbonate deposition, but the carbonate dominates, shallow water, four to six feet. 3.50- Shallow water carbonate bottom, the white areas are washouts with carbonate sands and muddy sands and the brown areas are Thalassia stabilized carbonate sands and muddy sands. 5.5-6- Low lying carbonate islands off to the right are the south end of Hicks Caye, mainly mangrove vegetated with supratidal flats that are flooded during high tides and after heavy rains. Note the brown patches of Thaiassia on the carbonate sands and muddy sands on the sea floor. 9.00- Still Hicks Caye off to the right, further away. From time to time you may note what seems to be car tire tracks on the sea floor. These are very shallow areas where skiffs with two motors touched bottom with the propellers and broke up the Thaiassia. There is no way to describe where these will be as the Thaiassia grows back quickly and obliterates the marks..
13.00- Caye Corker off to the right in the distance, a small new island just forming, much closer. 15.00- The island off to the left is Congrejo Caye,and you can clearly see the line of breakers off to the right that is the barrier reef. 16.00- Congrejo shoals off to the left, the barrier reef is off to the right and Ambergris Caye is dead ahead. Congrejo shoals are a series of tidal channels with new islands forming between them. The northern part of the shoals already have been mangrove vegetated and are partly above sea level. This is the process by which Ambergris Caye is still growing towards the South. 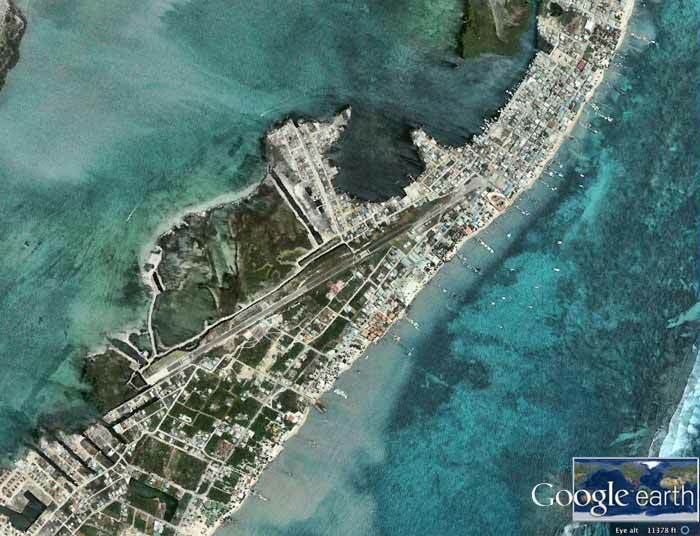 17-18:00- Marco Gonzales Maya site is the area about 1/4 mile north of the last tidal channel. The site stands higher than the surrounding swampy area. You are now flying over the southern end of Ambergris Caye, note the vegetated island with numerous interisland lagoons with shallow water. Note the abundant coconut palms on the windward (east) side of the island and the occasional fish traps. The fish traps are the little rows of posts extending out from the island with the heart shaped ends (see Miscellaneous section). 19:00- San Pedro lagoon is to the left, the reef is to the right, you are now descending to land on that elongate postage stamp, but they never miss it! 19-20:00- The wheels should be touching down on the San Pedro airport. Click here for some photographs and more information on what you see on this flight. Hop on board one of Belize's "puddle jumpers" and experience the scenic flight on Tropic Air's Flight from Belize City Municipal Airport to San Pedro, Ambergris Caye's John Greif II Airport. Veiw mangrove islands, the Great Barrier Reef of Belize and the famous islands of Caye Caulker and La Isla Bonita Ambergris Caye.